Home » Nicole Bernadette » Man’s Love Affair With Knowledge: A Bad Romance? Man’s Love Affair With Knowledge: A Bad Romance? Sitting under a university tree, leafing through my scientific history seminar textbook, I’ve come in contact with these words once again. The first time I read them, I scrawled in the margins in a kind of school-girlish shock: “This is odd. Aristotle says that knowledge is in man’s nature and defines his function. I always thought that it was natural to want to know!” Since then, I have been thinking about this dichotomy. Can too much knowledge be a bad thing? Can we get so obsessed that we work ourselves to death? Certainly we can. But is this sacrifice necessarily a bad thing? 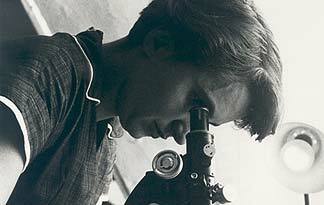 If it is successful—like Rosalind Franklin’s slow death to radiation poisoning from her incredibly valuable x-rays of the double helix—can’t this obsession with one’s work become something of a scientific martyrdom? Would her life really have been “better” had she gotten married and lived the quiet life of a housewife, the fate to which she might have otherwise been condemned? This, of course, leads to the question: what makes a life valuable? Certainly, if a person on his deathbed is able to proclaim, “I’ve had a good life,” he probably has. But what, if Kierkegaard suggests, his life was not at all a good one and he was merely deceiving himself to think that it had been? Even though knowledge for the scientist leads to self-fulfillment, murders may have a similar effect for the homicidal maniac! In this way, no one can argue that simple self-fulfillment gives life value if that fulfillment is built on a flawed basis. However, if this fulfillment is derived from an activity that has aided society (in a way that is, above all, virtuous), like science, I believe that it is certainly valid. After all, despite some of the problems that science has caused, one needs only to take a look at our Medieval ancestors to realize that the complete absence of scientific understanding is not a positive societal nor a very virtuous or reasonable force!